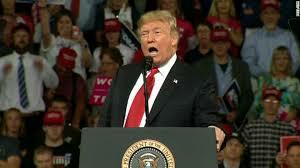 After winning the Senate confirmation of his Supreme Court nominee Brett Kavanaugh, Trump called Democrats at Kansas rally as "Party of crime", "Angry Left-Wing Mob"
President Trump at Kansas rally to blame Democrats as "Party of crime". VietPress USA (Oct. 7, 2018): President Trump called the GOP controlled Senate vote of 50-48 to confirm Judge Brett Kavanaugh the lifetime Supreme Court Justice is his "tremendous victory" when he delivered his speech to a cheering crowd supporters in Topeka, Kansas on Saturday night. Trump blamed Democrats as "Party of Crime" and as "Angry Left-wing Mob" who “disgraceful campaign” to “destroy” the judge Brett Kavanaugh. Hours after the Senate confirmed embattled Supreme Court nominee Brett Kavanaugh, President Donald Trump celebrated the “tremendous victory” in a speech delivered to a cheering crowd of supporters in Topeka, Kansas, on Saturday night — and excoriated what he described as the Democrats’ “disgraceful campaign” to “destroy” the judge. Pres. @realDonaldTrump: "You don't hand matches to an arsonist and you don't give power to an angry left-wing mob - and that's what they've become. The Democrats have become too extreme and too dangerous to govern. Republicans believe in the rule of law, not the rule of the mob." “In their quest for power, the radical Democrats have turned into an angry mob,” said the president, who was in Kansas to drum up support for Kris Kobach, the controversial secretary of state and hardline conservative who’s vying to be Kansas’ next governor, and GOP congressional candidate Steve Watkins. “Each of you will have a chance in just four weeks to render your verdict, on the Democrats’ conduct, at the ballot box,” Trump continued, warning of the “profound stakes” in the upcoming elections ― especially given the potential future openings on the Supreme Court. At one point in his speech, Trump claimed Democrats, who he referred to as the “party of crime,” had introduced a bill called the “Open Borders Bill” ― though, as CBS News pointed out, no such bill exists. Trump says again that Democrats' Medicare-for-all plans would "eviscerate Medicare." He never elaborates. Trump just making stuff up: "Every single Democrat in the U.S. Senate has signed up for the open borders - and it's a bill. And it's called The Open Borders Bill. What's going on? And it's written by - guess who - Dianne Feinstein." Trump reiterated his staunch support of Kavanaugh, his second Supreme Court pick since taking office. Kavanaugh was accused by at least three women of sexual misconduct but Trump insisted the allegations were part of an elaborate smear campaign engineered by the Democrats ― a conspiracy theory that was repeatedly pushed by Republican leaders in the lead-up to Kavanaugh’s confirmation vote. The president singled out Democratic Senators Cory Booker, Richard Blumenthal and Elizabeth Warren, who he again referred to by the derogatory nickname “Pocahontas,” for the “horror” they put Kavanaugh and his family through. According to The Washington Post, Trump’s support for Kavanaugh was met with great enthusiasm from the Topeka crowd. “Kavanaugh’s name elicited thunderous applause, with supporters cheering, fist-pumping into the sky and holding up babies in celebration,” the paper wrote. Trump said earlier on Saturday that he was “a hundred percent” certain that Christine Blasey Ford, the California professor who accused Kavanaugh of sexually assaulting her when they were teenagers, had named the wrong man.